Actor Shah Rukh Khan and MS Dhoni’s daughter Ziva Dhoni is taking the internet by storm once again with their throwback picture. The adorable picture has once again resurfaced on social media and is going viral. 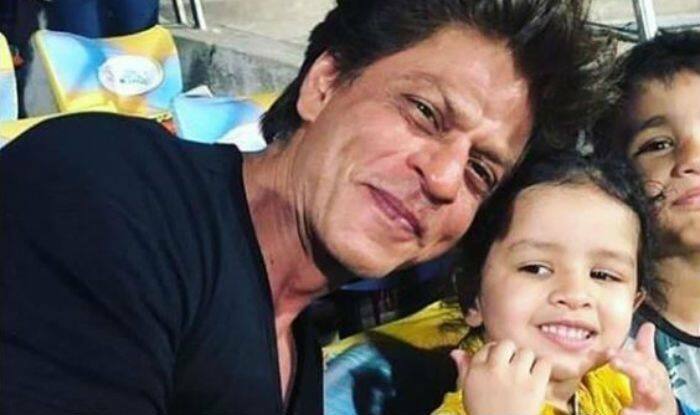 At the Chennai Super Kings versus Kolkata Knight Riders IPL 2018 match in Chennai, SRK and Ziva were seen happily posing in the stands. Not only this, but SRK did not miss the opportunity to click a selfie with the munchkin. In the pictures, Shah Rukh is seen wearing a black T-shirt while Ziva looks cute in a Canary yellow sleeveless dress. In another picture, they can be seen looking at each other and making a happily cute face as they get clicked. Thought while waiting to go back home to Mumbai….I should for no reason do a Chennai Selfie…so..bye Chennai & all the wonderful friends I met from the film industry & of course the sporting crowd at the stadium. Whistle Podu!! Lately, he has been in the news for stepping out of Farhan Akhtar’s Don franchise due to the reason best known to him. SRK has also opted out of the much-awaited Rakesh Sharma biopic titled Saare Jahaan Se Achcha. It is believed that after the failure of Zero last year, Shah Rukh consciously decided to not take up another space film and therefore, moved beyond the Prakash Kovelamudi-directorial. MS Dhoni and Sakshi’s daughter Ziva Dhoni has now become social media’s favourite kid. Her pictures and video often take the internet by storm and make everyone go ‘aww’.